FILE - Alexandre Benalla, French presidential aide, is seen during the May Day rally in Paris, France, May 1, 2018. 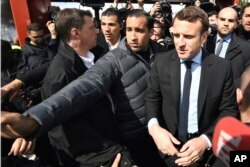 A former senior security aide for French President Emmanuel Macron is insisting he was trying to help police when he was caught on video assaulting a protester at a May Day demonstration. The outcry sparked by the video is the most damaging scandal to hit Macron since he took office last year. The former security aide, Alexandre Benalla, who was fired by Macron on Friday, said Monday his action was "vigorous but without violence and caused no injury," according to a statement released by his lawyers. "This personal initiative ... is obviously being used to tarnish the president in circumstances that defy comprehension," the statement read. FILE - French centrist presidential election candidate Emmanuel Macron, flanked by his bodyguard, Alexandre Benalla, left, arrives outside the Whirlpool home appliance factory, in Amiens, northern France, April 26, 2017. Benalla, along with another member of Macron's ruling party, Vincent Crase, were charged Sunday with violence, interfering in the exercise of public office and the unauthorized public display of official insignia. The video made public by Le Monde newspaper last week shows Benalla, who is not a police officer, wearing a police helmet with visor as well as a police armband while dragging a woman away from the crowd and later beating a male protester as riot police looked on while breaking up a May Day protest in Paris. Benalla said in the statement issued by his lawyers Monday that the man and woman he was filmed scuffling with were "particularly virulent individuals" whom he had been trying to "bring under control" while "lending a hand" to police. On Monday, Interior Minister Gerard Collomb told lawmakers he took no action against Benalla after the presidency assured him in early May that Benalla would be punished. Three high-ranking police officers have been charged with misappropriation of the images and violating professional secrecy for illegally giving Benalla video surveillance footage of the incidents to help him try to clear his name. They have been suspended from their jobs. Benalla, 26, handled Macron's campaign security and has remained close to the president.